Many homeowners believe applications of lime to the home lawn are necessary to maintain a high quality lawn. Few individuals, however, have a complete understanding of why lime is applied, how to determine if liming is needed, and how one should go about applying lime to the lawn. In fact, most homeowners are not aware of the potential negatives of creating high pH levels by excessive application of lime. Did you know that in some areas of the country, sulphur is required to balance a soil's pH? Whether you need to apply lime or sulphur, the important point is make sure your soil has a balanced pH level. Why should the soil have a balanced pH level? Scientific studies have shown that turfgrass grows better in soils where the pH level is balanced. This could be because microbes commonly found in healthy soils, like that balance. Their activity is balanced just as the pH level is balanced. The pH rating simply means how much acid (acidity) or how much alkaline (alkalinity) is present in the soil. The pH range is 1 � 14 and 7 is the mid-point, meaning � acidity to � alkalinity. Each plant has a level it will tolerate, past that level the plant will look sickly and generally not grow at all in some situations. The basic pH test only gives the acidity/alkalinity level and is one of the easiest ways to improve the soil. How much do you add? This is what a soil test will tell you, as well as the texture of the soil� loose sandy soil all the way to hard clays , each need different amounts of chemicals to alter the pH. 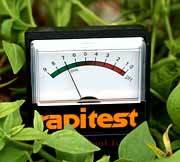 Complete soil testing can also tell you what trace minerals or additives are needed. Soil testing and soil samples Your local state or county extension offices are paid by the public to help in giving you all kinds of information on how to take these soil samples and for a small charge they will usually give you detailed written recommendations on what should be added to the soil and suggested fertilization rates for lawns. When is the best time to apply lime? Lime can be applied anytime during the year as long as the ground is not frozen. However, the ideal time is just after a core aeration treatment. This allows the lime to reach the deeper, root zone of your turfgrass, quicker and be more effective faster. A soil test should be taken every year for 3 - 5 years to get a good idea of any swings in your soil's composition. Then after that once every 3 years should be adequate.